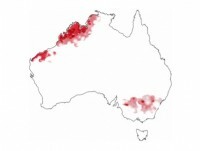 The late start to the 2011 wet season has seen severe MVEV infection in the northwest, where its main endemic region now lies, and further afield in other parts of Australia. Every wet season Northern Australia faces the possibility of a surge in mosquito-borne virus infections. But the actual numbers of cases vary considerably. Some of that variation can be blamed on fluctuations in rainfall, the wetter years being worse for specific arboviruses like Kunjin virus and Murray Valley Encephalitis virus. You might think Murray Valley Encephalitis should be in the border territory between Victoria and New South Wales, where most of the early cases were described. But in recent years, MVEV has relocated in the Northwest where conditions appear to favour its mosquito vector and reservoir hosts more than the Murray Valley. It is fortunate that MVEV only rarely causes encephalitis, since long term complications of nervous system infection often follow this extreme form of the disease. Milder forms of infection are more common, judging from seroepidemiology studies. In the states where chicken flocks are monitored routinely, evidence of MVEV exposure usually precedes the first cases of human infection. This year, there have already been several cases of encephalitis and many more cases of milder disease. While most of these have occurred in the Northwest, there have been a scattering of MVEV infections in the Southeast. In Western Australia the earliest cases occurred a bit later than usual despite heavy rainfall early in the wet season. Satellite sensing is now being used to predict MVEV risk. However there are likely to be other drivers of infection risk, most likely affecting the complex interactions between virus, vector and reservoir host. I note your article on MVE. It’s not so much that MVE has “relocated” from the Murray Valley to the Kimberlies, it’s that there are two separate foci of the virus in each area. (MVE used to be found in the Weipa region of QLD too, but this seemed to have shifted west with the construction of the Ord river irrigation scheme.) Subtyping of the virus shows a number of distinct strains. During above average flood years, such as 2011 and 1974, you’ll actually find ORD (ord river) strains of MVE in the Victorian basin. I personally believe this is due to the whole of the inland waterway system being flooded and somehow facilitating the passage of infected water birds, mosquitoes or mammalian hosts between enzootic and endemic areas. Then, when humans intrude into these areas, an epidemic occurs due to higher levels of circulating virus at these times. Thanks for the informative comment and some interesting ideas. It would be useful to know how much viral persistence there is during the long dry season in the Top End. What impact is the increased area under irrigation (Ord phase II) going to have if you’re right?